Drew Brees throwing for 466 yards and three touchdown passes? Doesn’t surprise us. The New Orleans Saints not punting even once, going for it on every fourth down? Doesn’t surprise as well. The Saints now need to stun us by winning on the road, in the postseason, for the first time in franchise history. 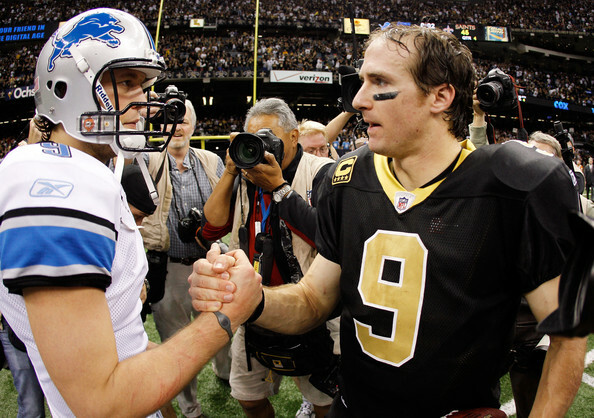 The Saints beating the Detroit Lions 45-28 was no surprise as well. If you wondered, offense was in abundance Saturday night in the Superdome. The Saints got 626, the Lions 412. Those 1083 yards tied a playoff record set by the Bills and Dolphins back in 1995. The Saints, unlike the Lions, got it going on the ground as well. They ran for 167 yards, 92 of them after contact, with Pierre Thomas, Darren Sproles and Chris Ivory sharing the load. For the Lions? Only 10 running plays and a total of 32 yards on the ground. It was obvious that the team that would come up with the big defensive plays, especially later in the game and not in the first quarter should go on to win the contest. The Detroit Lions made a huge leap this season, making the playoffs after more than a decade. Next year, it’s time to get the first postseason win in over 20 years. Sean Payton’s play calling was the big story, going for those fourth downs, letting his punter take some time off. The Saints have incredible confidence in Brees and the offense, and their incredible third down conversion rates during the regular season, 56.7%, 20 better than the league average with the noisy and pushing atmosphere in the Superdome hardly left him a choice to tell you the truth. The Lions too advantage of a Colston fumble early on, but they just couldn’t keep up. No team can the way the Saints are playing right now. Winning nine straight games, and Brees has thrown for over 300 yards eight games in a row now. Calvin Johnson’s incredbile night, catching 12 passes for 211 yards and two touchdowns was almost forgotten. He became only the third player since the merger with 200 yards and two touchdowns in a playoff game. Stafford? Started great, but later came the problems. The Saints’ pass rush really disrupted the former Bulldog, who threw two interceptions to counter his three touchdown passes. The 49ers won’t be able to keep up with the Saints offensively, but their defense is a different story. Their 3rd down stopping rate isn’t as good as the Lions’, but Brees shouldn’t feel as comfortable in Northern California. The pace will be different, and the 49ers won’t try to get involved in a shootout. On the other hand, the Saints are about breaking records this year, so why not set another milestone and win their first away game in the playoffs?